When we last met our intrepid traveller, he was sipping Vernaccia di San Gimignano and asking the universal traveller’s question, “What the hell are we going to do tomorrow?” Oh yeah, head to Bolgheri. 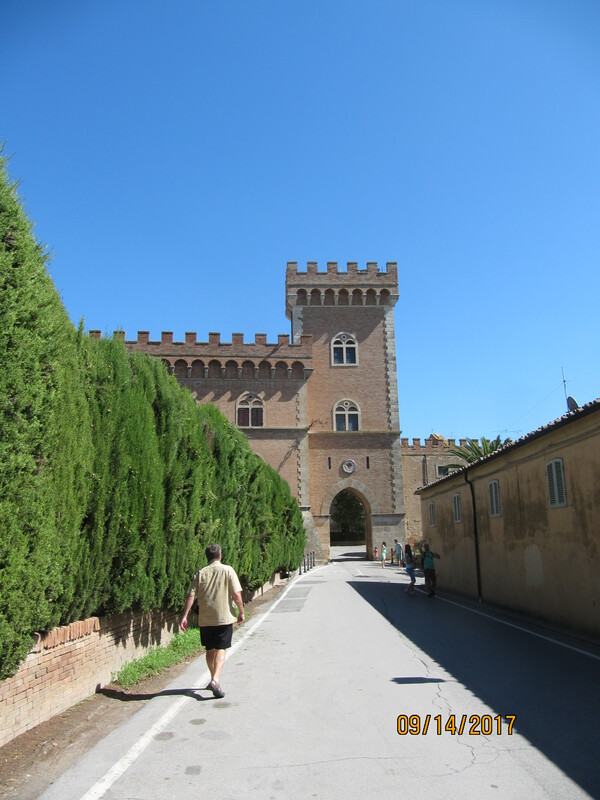 The plan was to wander Bolgheri and then head to the beach at Marina di Bibboni. 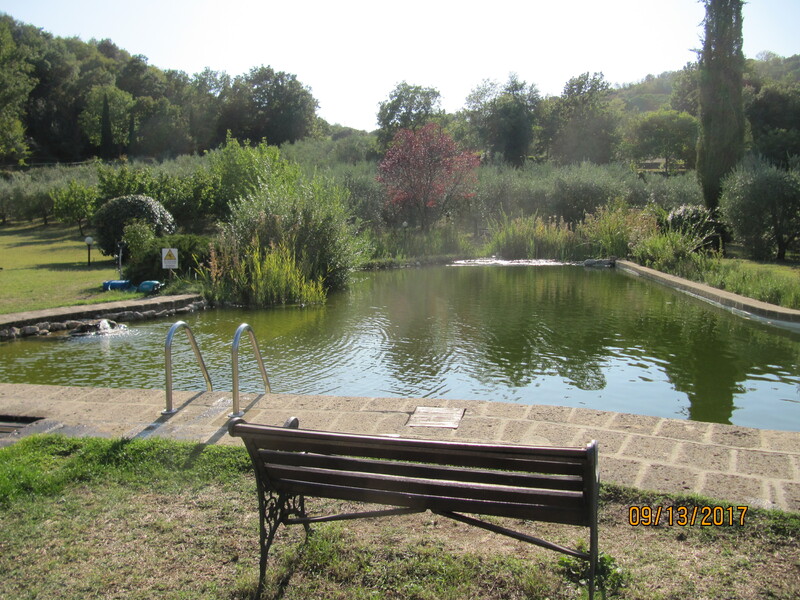 It was about a 50 minute drive from Volterra, Without a map or GPS – only 10 minutes longer. Yes, I’m the guy in the Fiat calmly driving the round-a-bouts twice. Did that ruin the day? Never. If you read my first instalment, you know that getting lost can be… not exactly fun, but interesting. Plus, it’s a character builder. First, I’ll tell you a little about Bolgheri as a wine DOC. DOC Bolgheri and DOC Bolgheri Superiore lie south of Livorno between the Tuscan hills and the coast, near the village of Bolgheri. The DOC isn’t big (1200 hectares – 40 members of the Bolgheri Consorzio) but it is mighty. Many of the first Super Tuscans came from Bolgheri with Sassicaia (first made as such in 1968) being the most famous. 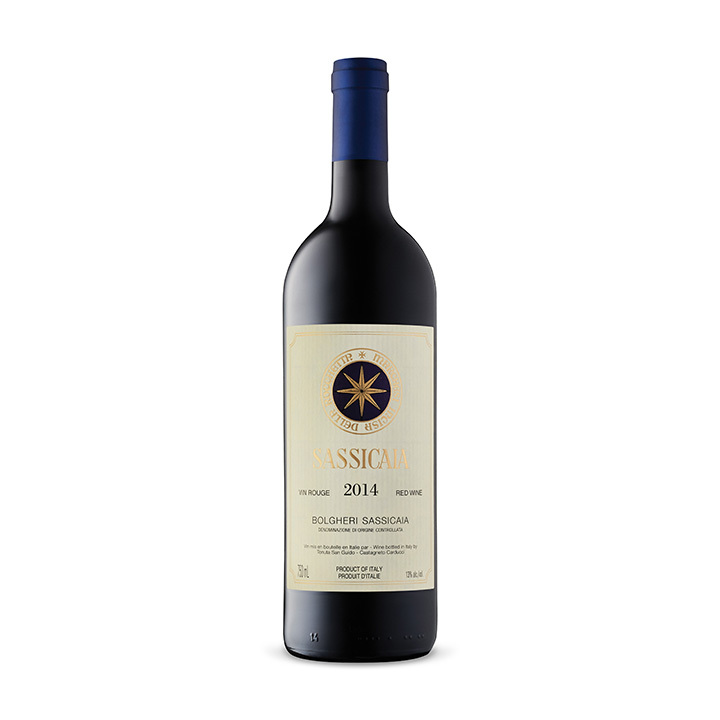 In fact there is a DOC Bolgheri Sassicaia which requires 80 % Cabernet Sauvignon, aging for 2 years, 18 months of which has to be in 225l barriques. Wow, that’s prescriptive! The distinguishing thing about DOC Bolgheri red wines versus other Tuscan DOC’s/DOCG’s is the use of Bordeaux varieties (allowable % in brackets): Cabernet Sauvignon (0% – 100%), Merlot (0% – 100%), Cabernet Franc (0%-100%), Petit Verdot (0% – 30%) and Syrah (0% – 50%). they also continue to grow Sangiovese (0% – 50%). It’s hard to keep up but just think that most of these wines feature the Bordeaux Big 4 potentially supported by Sangiovese and Syrah. Of course, wineries can make wines somewhat outside these restrictions but they’d be IGT Toscana wines not DOC Bolgheri. Confused? Bolgheri labels that you might know include Guado al Tasso, Tenuta San Guido, Satta, Le Macchiole, Tenuta dell’Ornellaia, Podere Grattamacco, Campo all Sughera, Poggio al Tesoro, Gaja Ca’Marcanda, and the list goes on. There is still a wee bit of controversy about the use of traditional ‘Bordeaux’ grapes instead of autochthonous (wine geek speak for ‘indigenous’) grapes in Italy – Sangiovese, Trebbiano, Barbera, etc. While I agree that there already is enough Cabernet Sauvignon and Merlot in this world, there are two compelling reasons that I’m a ‘yeah’ to Bordeaux in Tuscany: 1) the wine is really, really good; 2) everywhere else does it, so why dis Bolgheri. And did I mention, it’s really good? Although reservations to visit may, in fact, be needed in many wine regions in the world, reservations really are the exception. When we were in Napa, you needed reservations for Duckhorn, Quintessa, and Caymus, for example. But many other wineries accommodated you as a walk-in. Similarly in Niagara, Languedoc, and much of Tuscany. These wineries have adequate tasting rooms and sell much of their stuff from the cellar door. Well, Bolgheri don’t roll like that, baby. I guess Tenuta San Guido doesn’t want a busload of seniors from Goderich, Ontario working their way through a case of Sassicaia one taste at a time. Then buying a few sachets of lavender and staggering out to the bus. In this environment, the one casualty of playing it ‘by ear’, other than a poor rendition of Smoke On The Water, is that you might not be able to taste at some wineries. Hell, you might not even get in through the automated gate. We did have a reservation at Le Macchiole but it cratered. So, we wandered around anyway – dropped in to Guado al Tasso, Relais il Beserno (unbelievable place), Tenuta San Guido – nice chats but nary a drop of wine. I was getting thirsty. In my Lonely Planet it talked about a wine bar in the little town of Bolgheri where you can taste just about anything that comes from Bolgheri. As if. 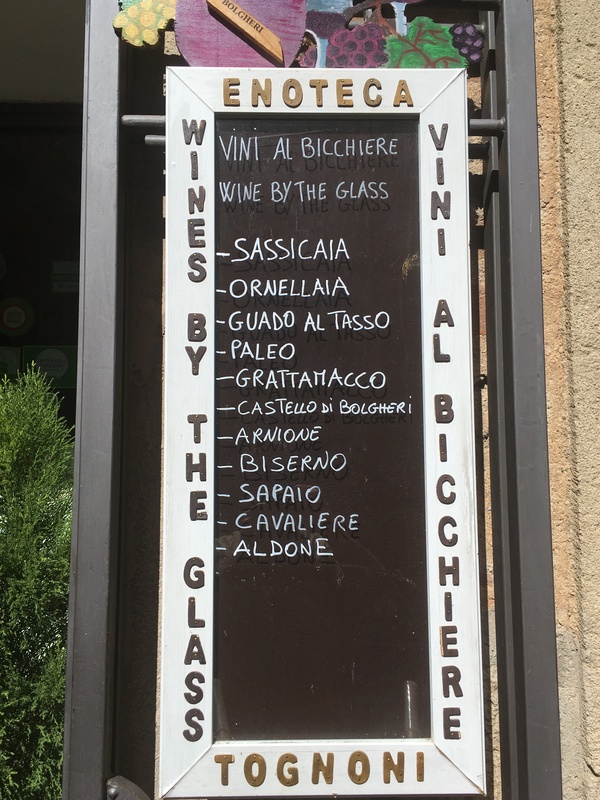 So, we wandered into the town and found the sign below out front of Enoteca Tognoni! Seriously? You are reading that right, wine peeps. Ornellaia and Sassicaia by the glass! And, you can get tasters of it too – 5cl or 10cl. Friends, there is a bit of a downside to having this type of selection and, in Italian, that downside is called il conto. 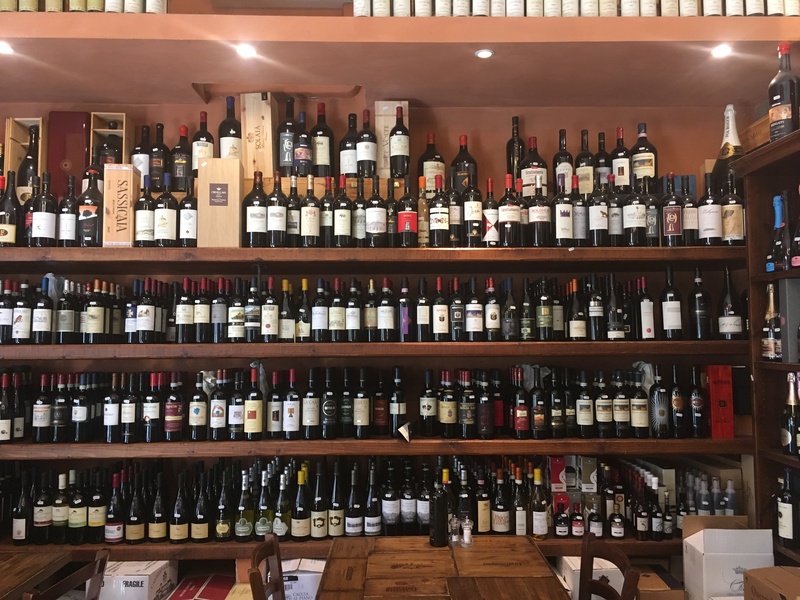 The inside of Enoteca Tognoni is crazy cluttered with wine bottles, stacks of half-opened wine cases and amongst all that, tables to sit, taste, and eat if you wish. It’s atmospheric. I’ll give it that. Service was exceptional. We had a very knowledgeable woman who took time to give us a selection that fit our palate, pocketbook, and understanding. She stood by us and explained each wine – who, what, particularities, vintage, etc. Here’s the thing. Is it expensive? Yeah. But, will I ever have another chance to taste these wines together? Probably not. So forget il conto and taste! 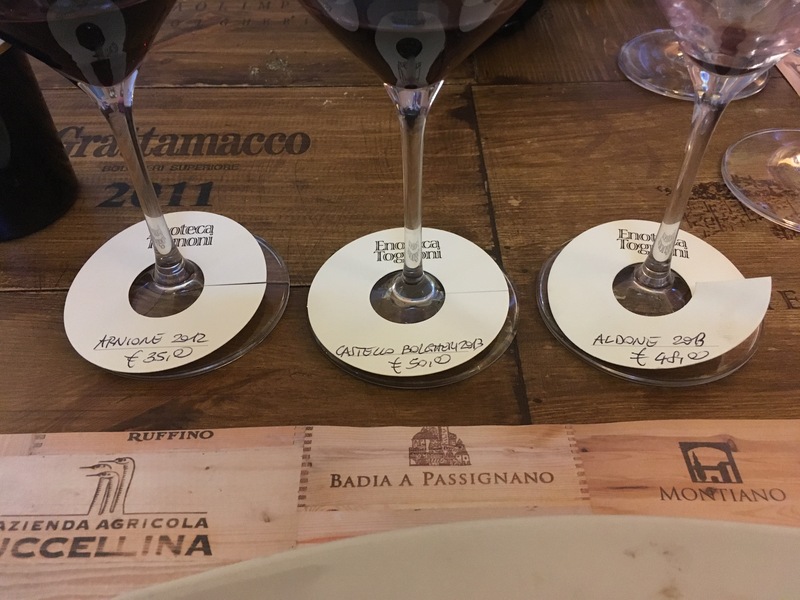 One flight tasted out like this – 2012 Arnione €35 from Campo alla Sughera. Made from 40% Cabernet Sauvignon, 20% Cabernet Franc, 20% Merlot, and 20% Petit Verdot – powerful, balanced and still early in its development. This carried the day for me. I know that the Merlot here was just one of many players but it shone through – cherry and mint. Smooth tannins, deep wine. Loved, loved this wine! The 2013 Castello Bolgheri €50 is 50% Cabernet Sauvignon, 25% Cabernet Franc, 20% Merlot, 5% Petit Verdot. It was strictly cellar material – fruit hiding behind tannin and acid. Nonetheless, it was powerful stuff which seems to be the theme here. I wish that I could figure out where it might end up. The last of this flight 2013 Aldone €48 from Terre dei Marchesato is all Merlot. It did have a real Pomerol feel to it. Dusty, tannic and needing a load of time in the cellar. It opened a bit over time. Well, 30 minutes. 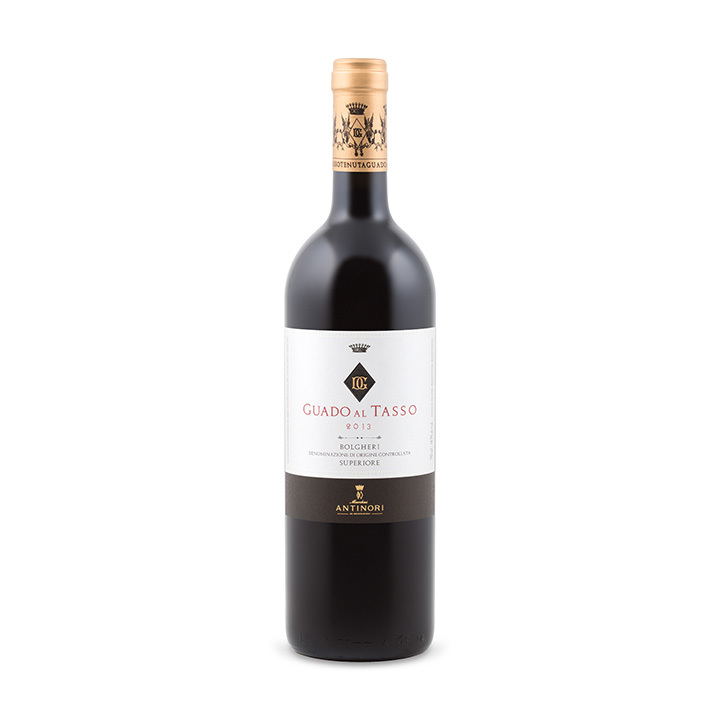 Another wine worth mentioning – 2011 Cont’Ugo €35 – 100% Merlot from Guado al Tasso (Antinori). And for the Cabernet Franc fiends out there, I tasted Le Macchiole’s 2013 Paleo Rosso €70 – 100% Cab Franc. Stunning! Still hiding out a bit but what a wine. These may all seem a bit on the expensive side but significantly cheaper than comparable Napa Bordeaux stuff. So, what did the Sassicaia by the glass cost? €40 is all. A tasting of 5cl (1.7 oz.) was €14. If you have to ask on the Ornallaia, you can’t afford it. I’ve had them both before – snobbish yawn. So, stuck to wines new to me. Did we get to the beach? We did. This wine stained wretch snoozed in the shade (wonder why I was sleepy) and my Mediterranean companion soaked up the sun. And, then it was back to Volterra. We went a different way. By design? Not really. We just kept heading to Volterra by road sign and then visually. Hard to miss Volterra when you’re anywhere within 40 kilometres. Then back to Podere San Lorenzo for nibbles and wine. I learned something in Bolgheri. I rail against big wines that are too oaked, too thick, too fruit forward, and/or just too much. And yet, I loved the wines that I tasted in Bolgheri and they weren’t shy, subtle, restrained efforts. They weren’t blockbusting behemoths (quoting Parker here) either. Likewise the wines that I love from Priorat – they too are largish. I may have to just admit that the issue of size isn’t as important to me as I let on sometimes. Maybe, “Size doesn’t matter,” he says, always the contrarian. Thoughts? What a great day. And Sassicaia by the glass? Only in Italy. I am loving your play it by ear journey! Thanks, Michelle. I never used to be able to play it by ear but then i married someone who only plays it by ear. And guess who won out. I learned to relax and really quite enjoy that approach now. You have to accept that you might miss some stuff but I’ve never suffered from FOMO. So no worries.